Our dining adventure began with complimentary fresh bread, Difo Dabo, and dipping sauce of hot chili powder (Berberé) infused in olive oil. 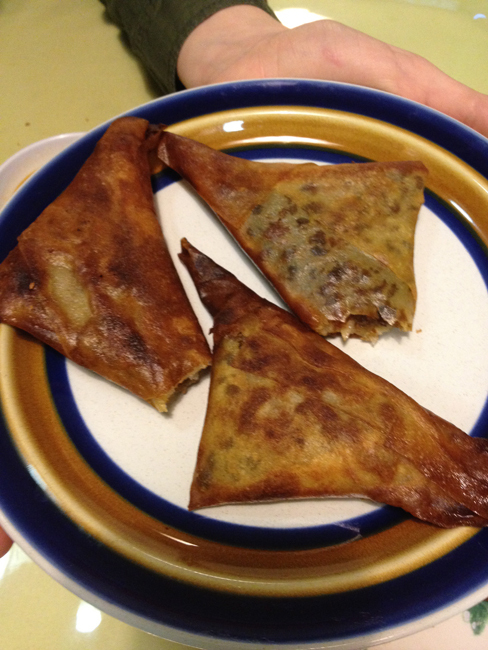 We also shared a single appetizer called Sambusa, which is a fried pastry crust filled with lentils, green peppers, and spices. 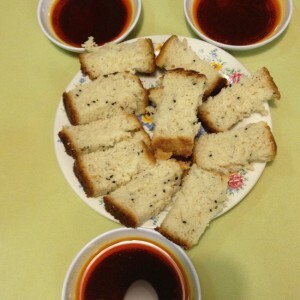 It was enough to share and delicious, even if a little oily. On the menu it was a nice surprise to have so many choices for the plant-based eaters as well as for our sole omnivore. It was also nice to see noted on the menu that all vegetarian options are vegan so there was no need to manipulate the menu. 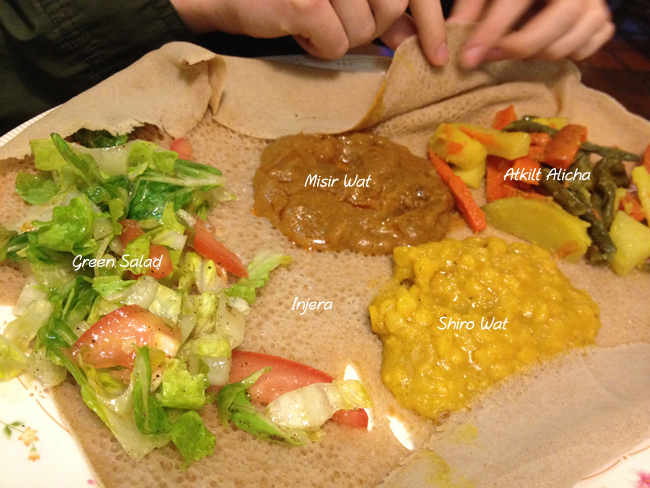 Ordering at Redi-et Ethiopian Cuisine was super easy. The traditional Ethiopian platter means choosing three vegetarian menu entrees which arrive with a salad on an oversized plate covered entirely and draped over the edges with Injera. Injera is a spongy sourdough pancake somewhere between the consistency of a pancake and a crêpe. The little holes on its surface, called eyes, give Injera its spongy texture. It is made from fermented teff, a very nutritious grain from Ethiopia, and possibly the smallest grain in the world. 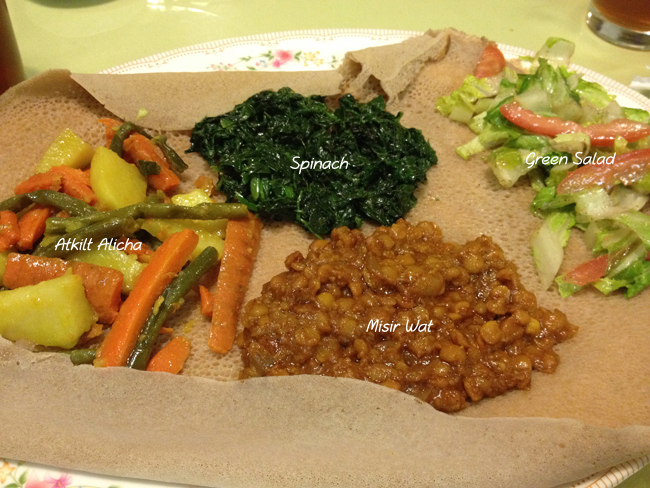 The stews, or wat (also spelled wot) and salads, are placed in little piles on top of the Injera. The Injera will become your only utensil. You will be given a plate of Injera on the side, if requested, usually served in long rolls at no extra charge. You tear off a piece of the Injera and pinch some of the stews or salads between its folds and just pop it into your mouth! The last thing you eat is the plate, which has absorbed all the delicious juices of the veggies. My daughter selected three mild/medium entrée items for her platter, Atkilt Alicha (potatoes, green beans, and carrots stewed with ginger root, and garlic), Misir Wat (red lentils cooked with garlic, onions, green pepper, ginger root, and turmeric, and Shiro Wat (sundried yellow split-peas cooked with red chili pepper powder, onions, garlic, and ginger). was in the South, even though the spinach was delicious. When I go again I will also ask for a hotter version of any of the hot dishes. The Misir Wat was just mildly hot, nothing scorching or even tongue tingling. Typically, most Ethiopian food is served spicy to very spicy, though many Ethiopian restaurants in the United States tend to err on the side of caution and cater to tamer American palates. Although this review is primarily for plant-based eaters, as I do believe that there are many ‘mixed’ families out there who need this kind of info, I must reveal my son’s dish was not vegan. As much as he said the flavors of his dish were fabulous, he reached repeatedly to our plates for Injera, and our vegetarian selections. Next time we go we might ask for his dinner as a platter with two vegetarian sides and Injera. Our dinner at Redi-et Ethiopian Cuisine was not only delicious and fun, the price was astoundingly fair and reasonable totaling only $40 for the three of us to dine! (Plus tip.) Here’s how it broke out: vegetarian platters were only $9 each (this was dinner not lunch), and my son’s chicken dish was $10. The appetizer was $3 for three (3) pieces of Sambusa and drinks/iced tea (with free refills) were $1.75 each. We did notice that the other diners there (all men) enjoyed beers, which looked like an interesting assortment. 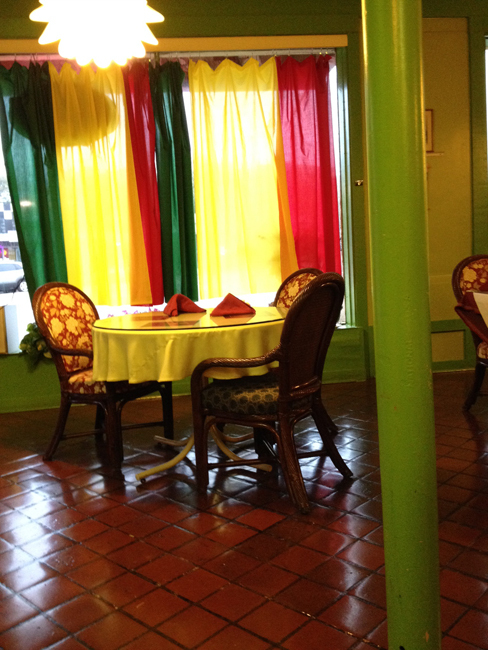 If we were staying in Myrtle Beach longer, Redi-et Ethiopian Cuisine would be on our list for a second visit and we will surely spread the word to friends and the plant-based community about this great place. Joanne Beccarelli is a health coach, writer, soon-to-be cookbook author, and founder of GLAD for Health, a company dedicated to helping the overwhelmed, overworked, and overstressed find their health and lost spirit. Motivated by numerous health-thru-food documentaries, Joanne embarked on her own health journey over 2 years ago, regained the person she had lost, and found a new life focus. After considerable independent research, she pursued a Certificate in Plant-Based Nutrition from Cornell University and the T. Colin Campbell Foundation and trained as a Holistic Health Coach at The Institute of Integrative Nutrition. Joanne has dealt with the pressures of ‘doing it all’ with over 30 years in the business world including owning her own consulting company (Bezwax, Inc.), and being a mother and wife. Joanne brings this wide perspective and breadth of experience to her coaching practice and in mid-May 2014, she will join Joe Cross (from Fat, Sick and Nearly Dead) as a Wellness Coach at Camp Reboot 2014. Through it all, Joanne is an accomplished problem solver, teacher and most of all, a passionate mentor. Learn more about Joanne and GLAD for Health .